I skipped this on Tuesday so Dr. Bitz's post wouldn't get overposted, but here's the monthly look ahead to what we'll be covering in X-aminations next month. Straightforward, indeed... this looks like the first time since you started these previews back in January where only issues of the core title are listed! Say, will you be reviewing Wolverine in publication order, which places it smack-dab in the middle of the Brood Saga, or in chronological order, which is about six months after it was published? For that matter, I believe the first few New Mutants issues take place during the Brood saga while the X-Men are in space, but were published after it. Thoughts on those? And for that matter, as New Mutants is fast approaching, have you decided yet how you're going to cover it in relation to your X-Men posts? Also -- wow. I forgot how fast "New Mutants" came on. I feel like we were just discussing Dark Phoenix. What were sales like around this time? It still feels like a quick turn-around from "good enough to not get canceled, but still not good" to "merits spin-off." Well, I may be jumping the gun in saying it's "fast" approaching... It would be somewhere around issue #170, I believe, so as of right now we're still probably four or more months away. Teebore! Your audience demands an... um, audience! @Matt: Say, will you be reviewing Wolverine in publication order, which places it smack-dab in the middle of the Brood Saga, or in chronological order, which is about six months after it was published? That one I'll do chronologically (in one post), between issues #171 and #172. Well, my overall plan for New Mutants is to do one issue a week, just like X-Men, covering the issue of NM that's published the same month as the corresponding issue of X-Men, such that even if the events between the issues don't quite synch up, we're recreating the experience of reading both issues off the racks back when they were originally published. That said, the events of the first three issues of New Mutants (plus their first appearance) fit so neatly before X-Men #167, even though they were published after, that I'm tempted to start those early so that NM #3 leads right into #167. But then we'll be out of synch with the publication dates right from the get go, so I'm not sure. Plus, I haven't quite figured out how to the do the annuals, which weren't always published at the same times. So I've still got some decisions to make. @Michael: What were sales like around this time? It still feels like a quick turn-around from "good enough to not get canceled, but still not good" to "merits spin-off." I don't have any hard numbers (though I feel like another Statement of Ownership is coming up soon), but I'm pretty sure we're still at "climbing steadily but not astronomical" at this point. 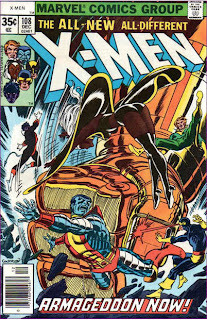 I'm pretty sure it's right around the Paul Smith run that X-Men first settles in as the best-selling title for awhile. @Blam: Your audience demands an... um, audience! Teebore: Well, my overall plan for New Mutants is to do one issue a week, just like X-Men, covering the issue of NM that's published the same month as the corresponding issue of X-Men, such that even if the events between the issues don't quite synch up, we're recreating the experience of reading both issues off the racks back when they were originally published. "But then we'll be out of synch with the publication dates right from the get go, so I'm not sure." Well that could be solved if you just did the first three issues of NM alongside the issues they took place "during", then took three weeks off of NM before returning to it when the dates would synch up again. @Matt: Well that could be solved if you just did the first three issues of NM alongside the issues they took place "during", then took three weeks off of NM before returning to it when the dates would synch up again. Ah, that's not a bad idea. I wouldn't want to do that again, as once it gets going, I want to maintain the consistency of one issue a week, but once in the beginning wouldn't be too bad (and might even give me a chance to get ahead of the curve a bit).